I'm new in lightning own Models and need some help regarding the equipment I'll need. Until now I've got only the Ghostbuster HQ Set from brickstuff, and for me it's a really amazing solution. 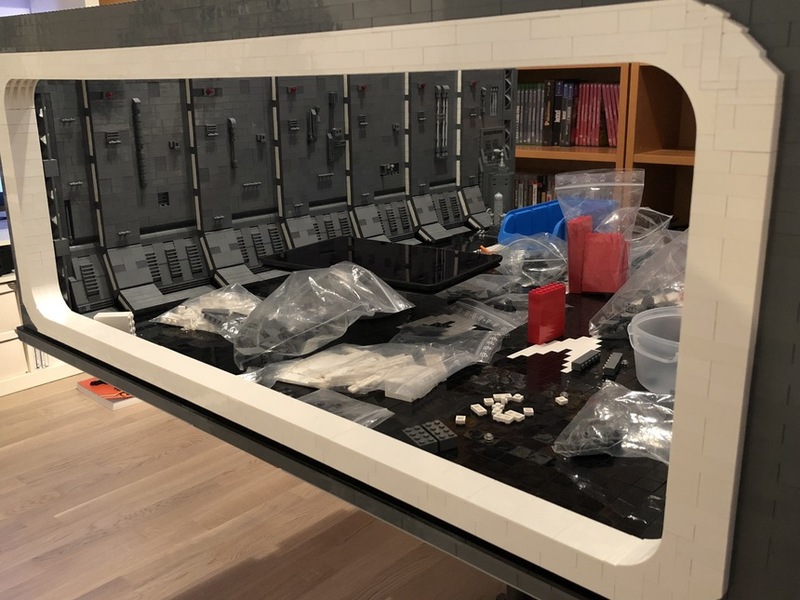 If I have seen the new Millenium Falcon Set, I've pre-ordered it, and now (of course) I would like to light up my Docking Bay 327 (the new home of my Falcon). As I said, I only ordered finished Sets until now, so I don't have any Idea, what items I have to order. Attached you will find a picture of the airstirp with some notes, what I'm planning. should blink like at an normal airstrip >>>> Maybe you could help me. Looking forward of your assistance. This was recently being discussed in an airport (Flughafen), here. 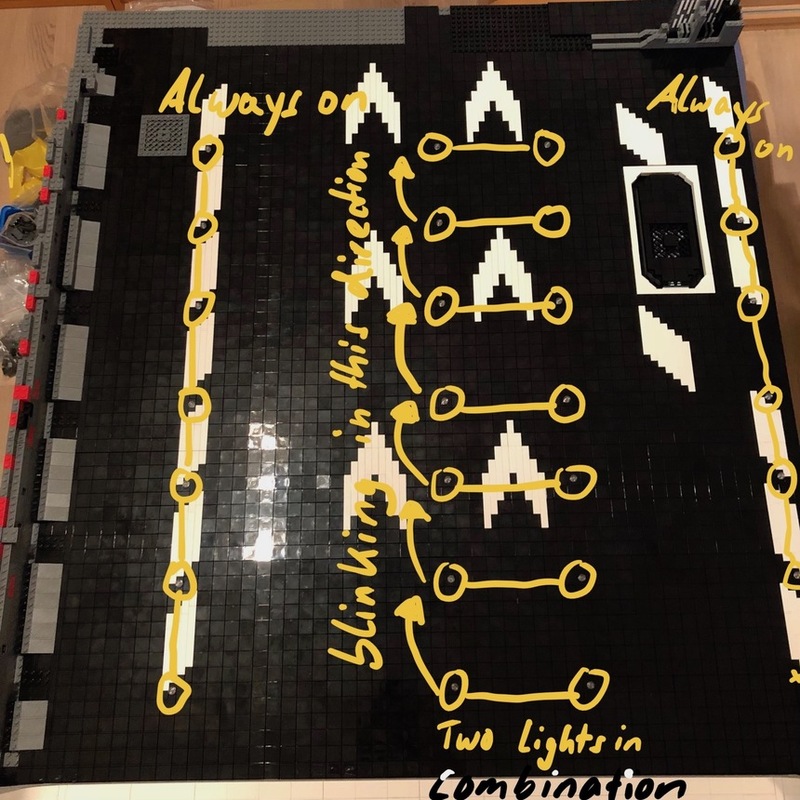 The 'always on' lights are simple to do, and the BrickPixel shown on the other page appears to meet what you have described. 1 1:2 Expansion or directly the USB Powe Cable? Correct? As you could see in the picture, I have 28 lights in total on the ground. Freakmaster Hello! Thank you for posting your photo and for your kind words about our Ghostbusters Firehouse HQ kit. For the "always on" lights, I'd recommend cool white Pico LEDs (in the 10-packs-- you could get three 10-packs total for this project and have 2 left over). 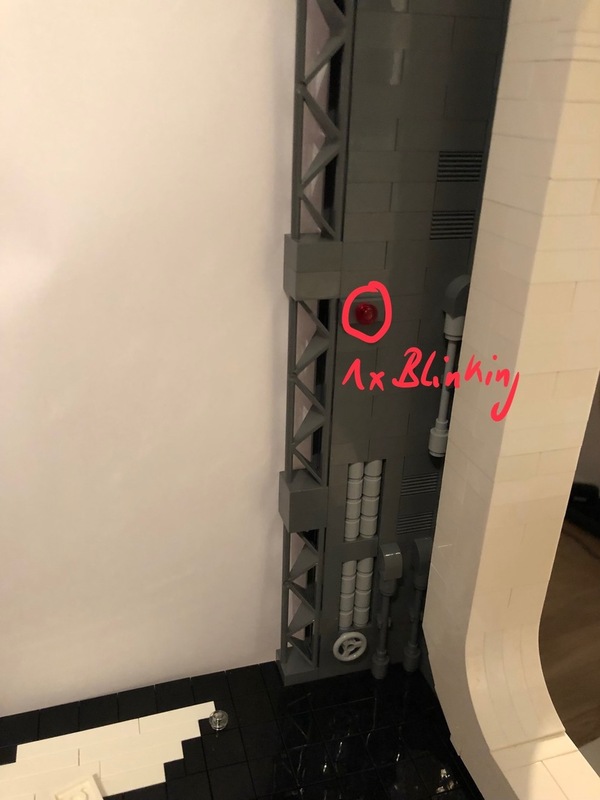 To connect the "always on" lights, do you have space under the docking bay to run wires and hide them? 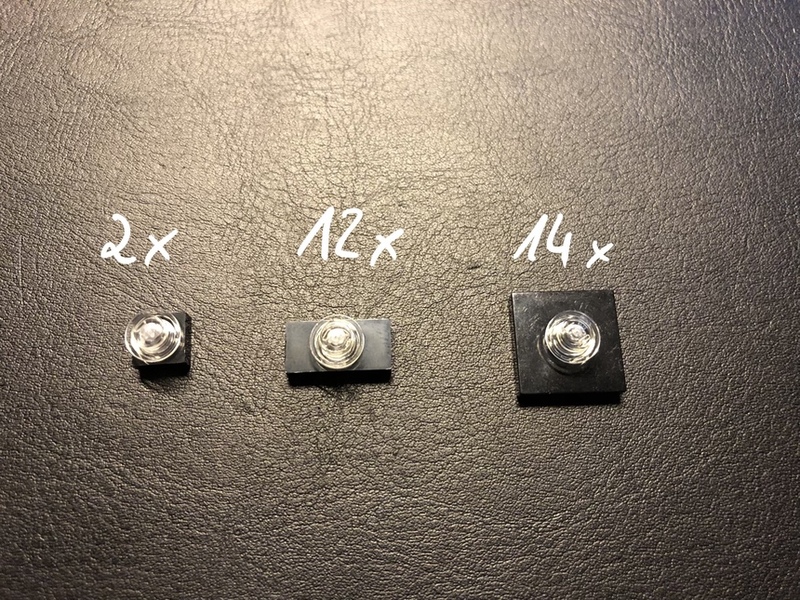 If so, the best solution would be 2x BRANCH10 adapter boards (each has 9 plugs so you could connect up to 18 LEDs to these boards). 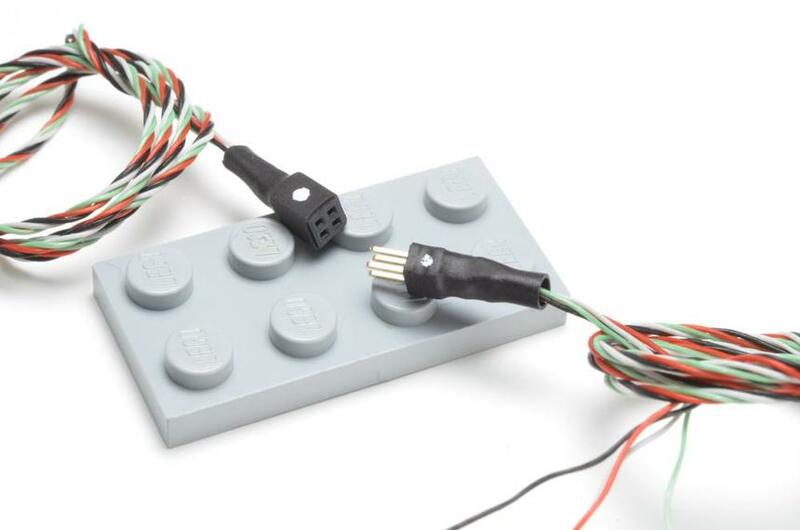 Get a 10-pack of 12" connecting cables and use two of them (one on each BRANCH10 board) to connect to a BRANCH04 board, then use another cable to connect this to power. 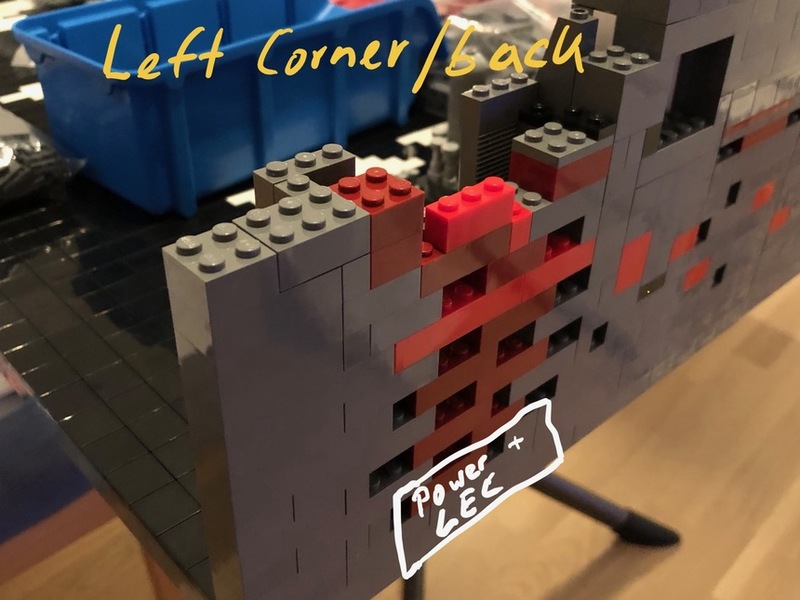 You could use the leftover 12" extension cables and BRANCH04 boards from the first part to connect the BrickPixel LEC to power. I'd recommend using our USB cable to power everything, since you'll have a lot of LEDs in this setup. If you have an extra iPhone or iPad-type charger for mains power, you can connect the USB cable to this and power all of the LEDS from a single source. I hope this information is helpful. Please let me know if you have any additional questions. 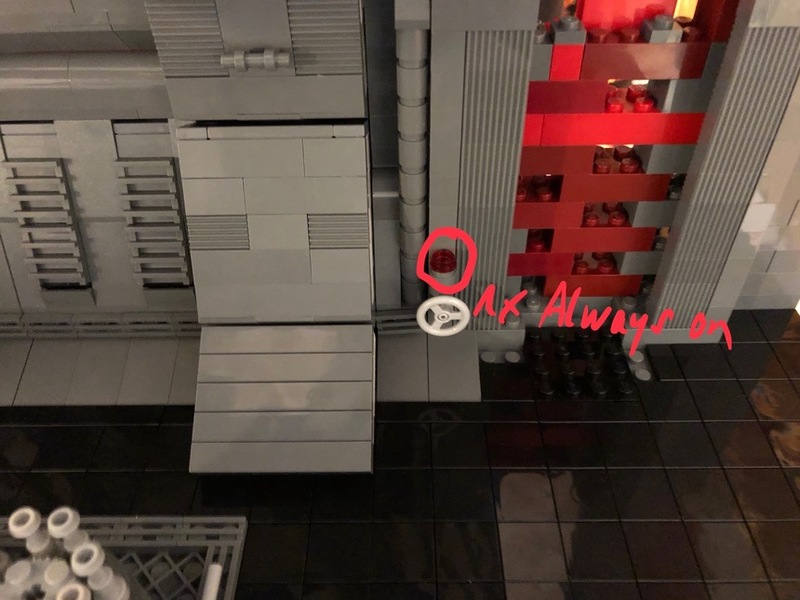 You can see the pricing for the "always on" lights on our website, and the pricing for the BrickPixel parts can be found at the end of the Forum post about the airport. If you would like to move forward, I can prepare a PayPal invoice for you (you don't need a PayPal account to pay). Thank you very much for sharing this project with us! I will check everything in the next days and inform you, what parts I will order. Freakmaster Sounds good! Are those jumper plates on the runway? If you'd like us to pre-mount the LEDs inside the jumper plates (drilling a hole in the middle), we can do that for you as well. That sounds great. Currently I use these plates. Freakmaster That will work. 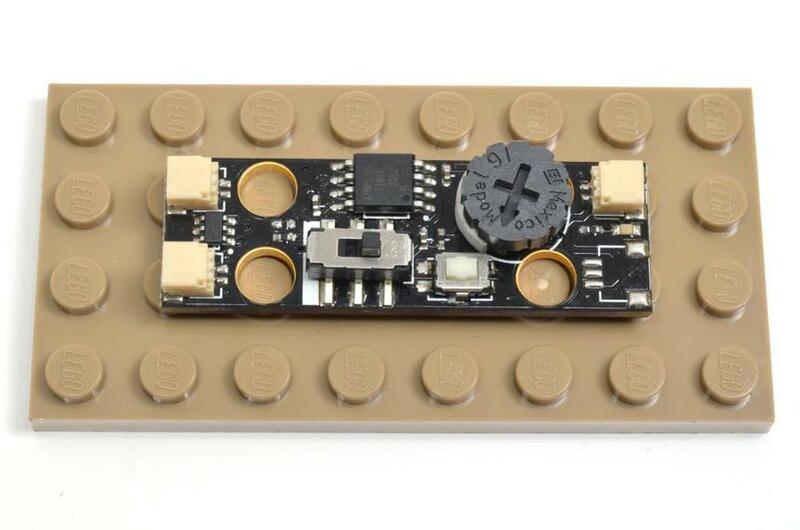 If you want us to supply the parts there will be a small additional charge (for parts), or you can order them on Bricklink from a US seller and send them to us in the US. Rob Klingberg Could you please give me a "all inclusive" offer? Especially for section 2 I don't know the prices. * 1 USB Cable for Power (if possible as single source. So please also add cables or adapters if I need more for a single source solution). for the 1x1 plate a special preparation doesn't make sense, or? Is there something I've forgotten? Oh, there is one more thing, I‘ve forgotten. I‘ve build this model modular, thereby I could show it on fairs. See attached photo. 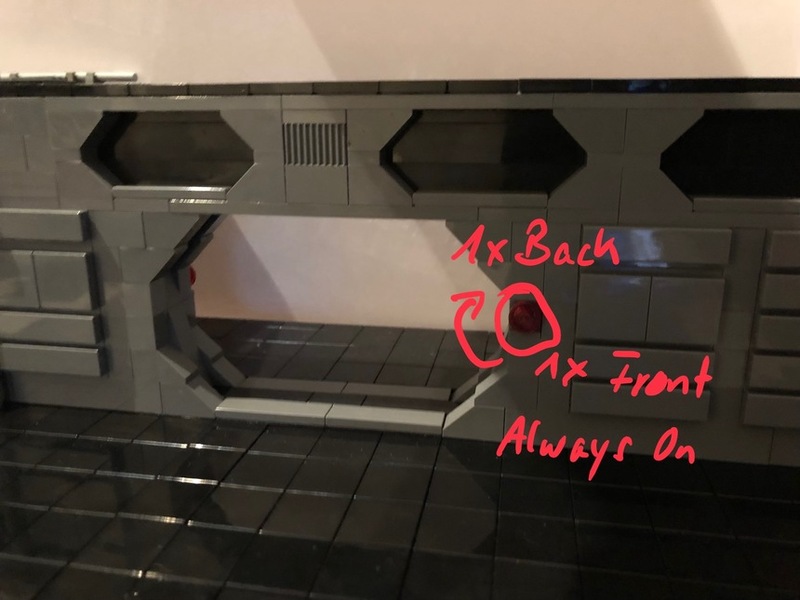 It‘s grouped into three sections, so it would be cool to arrange the cables with one connector on each section (2 connections). Rob Klingberg I tried to make a drawing that it is a little bit clearer. I know that now everything is more complicated, but I need the Dock in a Modular way, that I could transport it better to toy fairs, etc. So now we have to talk about three different sections. 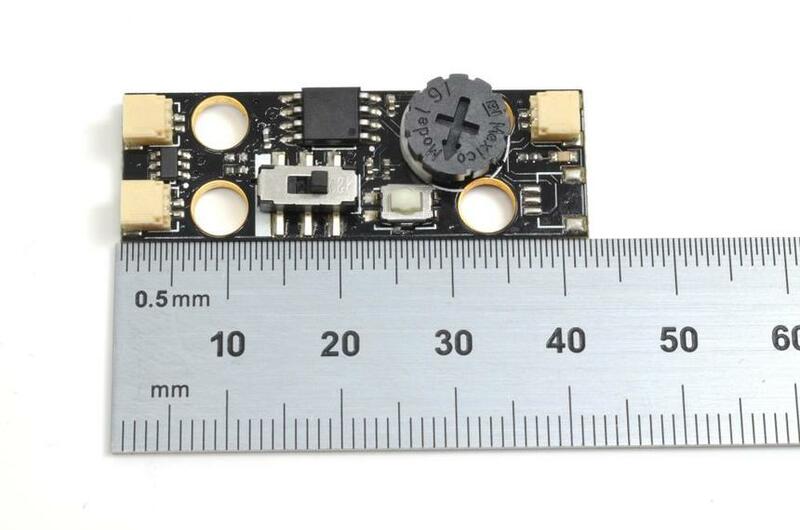 Do you have Connectors wich I could use to connect the 3 panels? 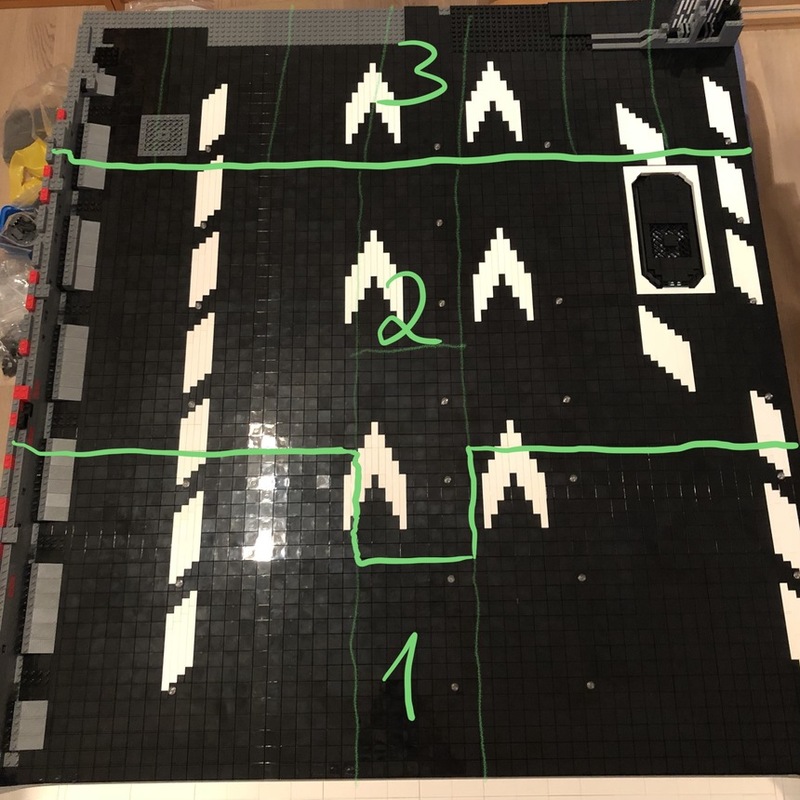 There have 4 wires, so that is enough to transfer power and signal for the "always on" lights and also the runway lights, so there would just be one plug to connect/disconnect between sections. We would have to make several sets of custom cables, but that's not a huge expense. Also, what is your e-mail address? Easier to send a price estimate there. We're excited to see this project in action! For the blinking lights, can we assume both rows will flash together? So for example, when 1.1.2 is on, 1.1.5 will also be on? And when 1.1.3 is on, 2.1.4 will be on? 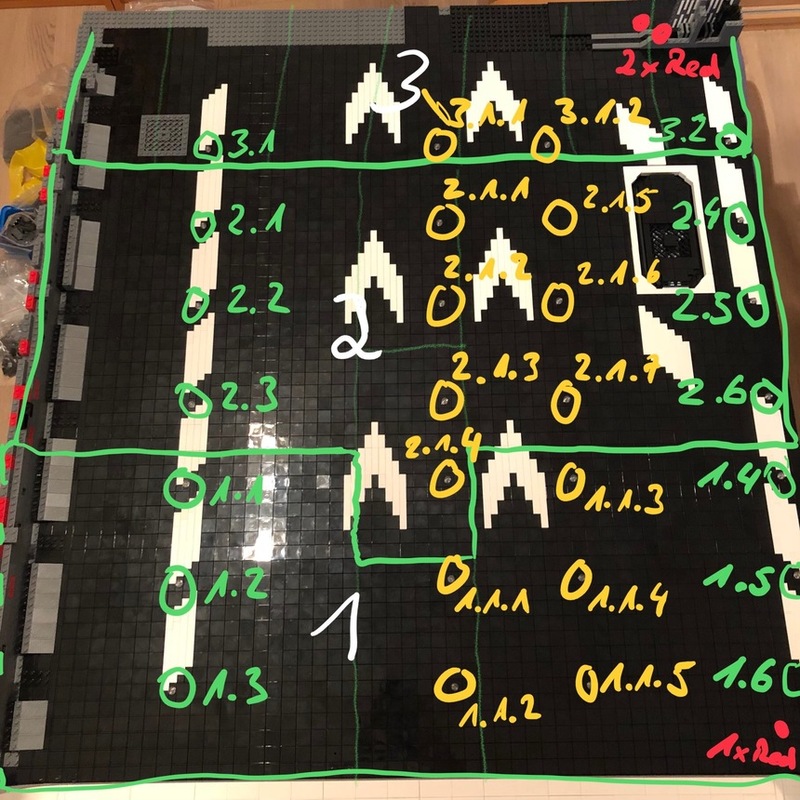 The little bump out for section 2 will create a little challenge where we'll probably need to make a second connecting plug just for that section, but we can do it. Freakmaster Thanks, I'll work up an estimate and a diagram and send in the next several days (working on many projects at once, but I'll get this to you as soon as I can). How about if pushing that button switched between flashing and "always on" mode? You'd have to make it so the LEC was somewhat accessible so you could push the button, but that's about the only way I can think of to get the effect. What do you think? 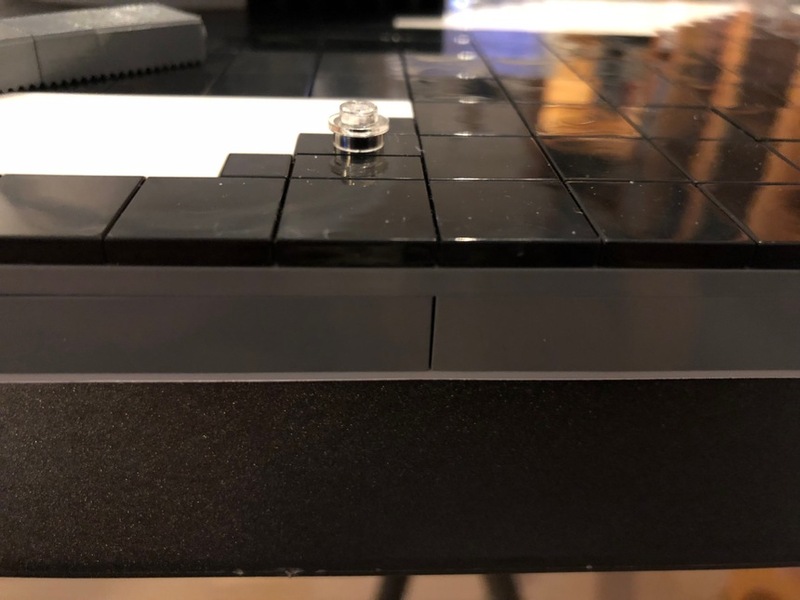 If the width of the LEC is fitting to the height of one standard LEGO brick, it would be possible to integrate it on the back side of section 3 (so this a Chance to use the LEC with the pattern Switch). I'll try to build an example to send you a picture (hopefully this evening). Could you please tell me the dimensions of this LEC? 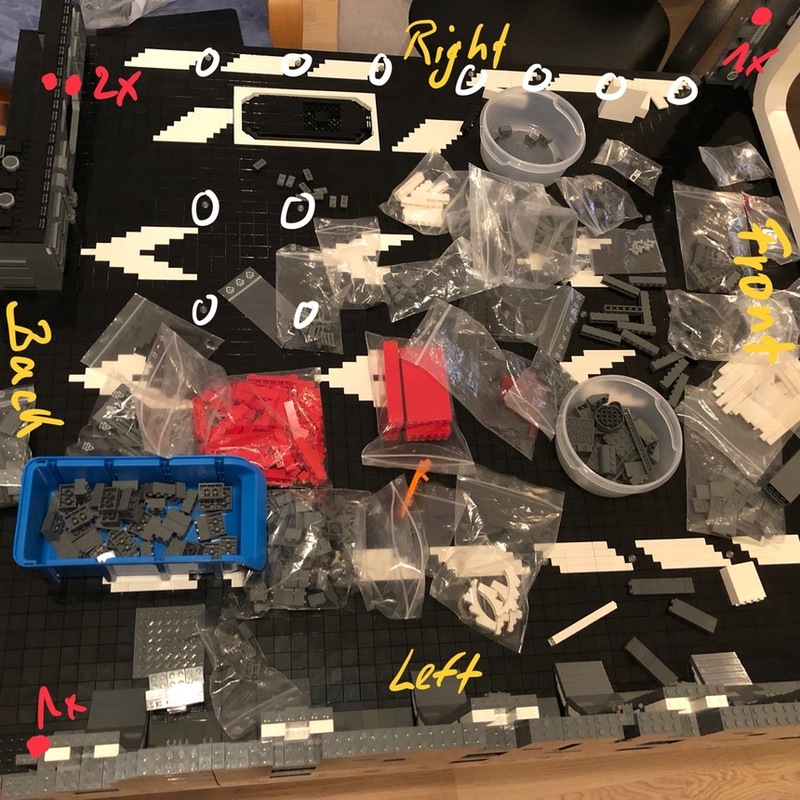 Also, can you let me know which side of the build will be the "front" (where the LEC will be), and also how you would like to power everything (USB cable, battery pack, etc. 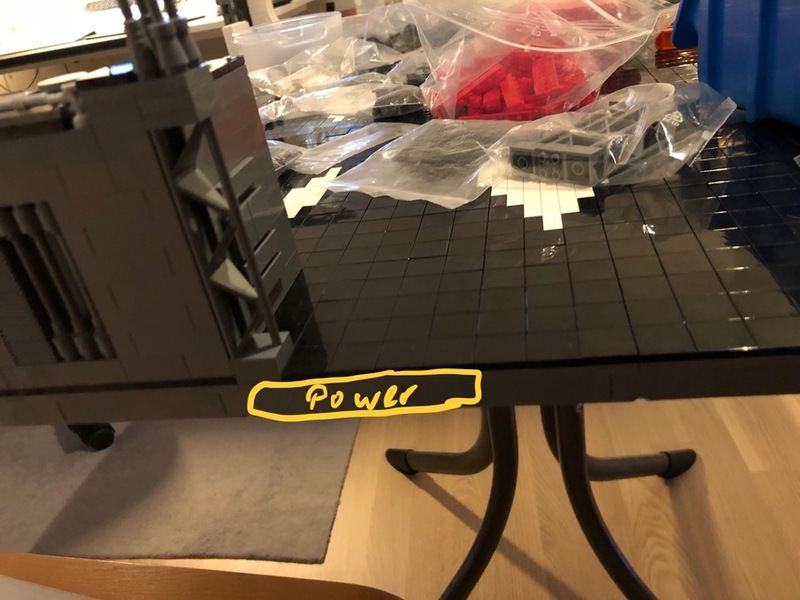 ), and also where the power will go. Rob Klingberg I tried to make some pictures and notices to give you an total overview and some of my thoughts. There are two possible solutions for the Power input and possibly the integration of the LEC with switch. On the pictures you could see 4 Additional red lights (nice to have, but nothing I'm dying for). So let's concentrate on the runway lights as in all our last posts discussed. On the first picture you could see, whats Front, Back, Left and right for me. Freakmaster Thanks for the additional photos-- helps with orientation. For the power input, I'd say you could take either approach-- if you could have access to both the LEC button and the USB input cable by mounting everything on the left/backside corner, then I'd go with that. Awesome looking work! I will be following this with interest as I am planning something similar! Rob Klingberg I had a new Idea, and added some additional lights, who should be integrated easily in the system. I will shoot some photos and send you an update..
First of all, a new picture for orientation.